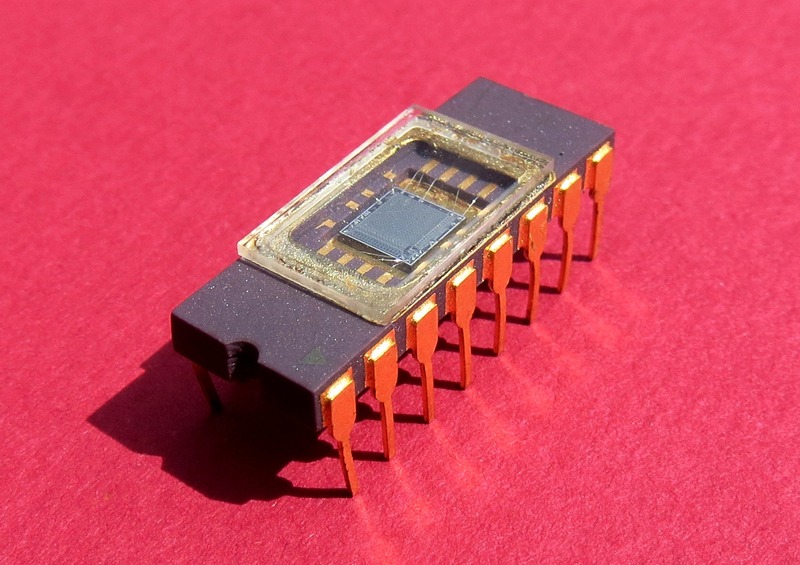 Back in the days when COMECON (RVHP) was cloning digital ICs usually the first wave of such ICs were in a ceramic package with a glass window (similar to EPROM) to check for bugs and stuff while used. Some chips were very sensitive to light and the window was usually covered by a sticker (also similar to EPROM). That sounds a lot like the Cromemco Cyclops. Released in 1975, it used a modified1 MOS 1kbit DRAM2 to capture a 32×32 black and white or greyscale image. The memory cells were initially set to all 1s. As they were exposed to light they would progressively switch to 0s; the more light hitting a cell, the faster the transition4. By making multiple read passes, a greyscale image could be read. The camera was sold with a case, lens, etc. along with controller cards for use in an S-100 bus computer. Given that the system was comprised entirely of off-the-shelf parts (with only one minor modification) and included complete source code it would have been trivial to clone both in the Eastern Bloc and elsewhere. 1 Modified meaning replacing the opaque die cover with a transparent one. 2 The same technique would probably also work fine with higher density non-buffered3 DRAMs. 3 Thanks to Raffzahn for pointing that out. 4 This results in a negative image when it is read out: 0s in the bright areas, 1s in the dark portions. Reading through the camera manual it seems the camera itself comprised of a case, lens, and 3 circuit boards. The front board had the image sensor, a sequential address generator for reading out the values, and two bias LEDs used to improve sensitivity in low-light situations. The second board contained support circuitry, and the third board contained the power supply and IO transceiver. Communication with the camera was over a pair of differential lines (one input pair and one output pair). There is no mention of frame rate in the camera manual, however in the interface manual (see below) there is a mention of a clock signal (1µs per pixel) and initialization time (5µs for regular capture, 17µs for capture with the bias LEDs active); it took as long to reset the memory cells as it did to read a single monochrome frame. Ignoring the setup time, the capture time for a single monochrome frame is 1024µs or ~976 frames per second. For full bit-depth greyscale images the sensor would be read 15 times in 15.36ms resulting in a maximum frame rate of ~65 frames per second (16.39ms or ~61 frames per second including initialization). The interface supported four exposure settings which modified the capture rate5; these resulted in greyscale frame rates of ~61, ~22.5, ~14, and ~10 frames per second. 15 reads per greyscale frame means the final, processed images were probably 4 bits per pixel (24 = 16). I'd have to read the camera and controller schematics and driver code more closely to be sure about any of the above. The computer interface used a pair of cards that plugged into an i8080-based S-100 bus system. These cards consisted almost entirely of 74-series ICs. Each card set could control up to 16 cameras. DMA was used to transfer images to the controlling system's RAM and an interrupt could be generated for each captured frame. Use of this card set was optional; the camera manual (mentioned above) describes the interface in detail and gives an example of displaying the image directly on an oscilloscope. The sample code provided is for an i8080-based system but I see no reason why the card set couldn't be adapted to S-100 systems using different CPUs. Both of the above-linked documents include complete schematics, parts lists, and IO protocol descriptions. 5 By adding a delay of 0, 2, 4, or 6 ms between each complete read of the memory (i.e. every 1024 bit reads). Alex Hajnal's answer pretty well describes what I believe is the first and eventually only commercial available camera that directly used RAM chips, the Cyclops (*1). It started out as a hobby level project, about the same time chip manufacturers did build the first dedicated CCD camera elements. CCDs were like the super hype of the 70s - at least to electronic freaks. For chip manufacturers, it wasn't a big deal to add secondary circuitry (like counters and DAC) directly on chip, and it does make a lot sense to layout the die to support the purpose, doesn't it? DRAMs are not laid out that way, but to simplify structure and speed up access. 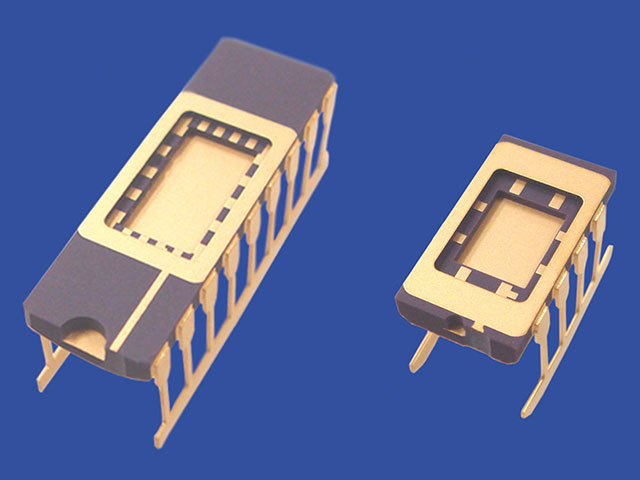 The CCD effect was discovered 1969 independent of DRAM development and based on the implementation of 1960s bucket based delay lines in silicon. The later DRAM development was based around the same idea of using a capacitor to hold a charge. Since silicon is prone to photon reception, the use as detectors is quite obvious. An important part is that the whole setup only works if the analogue structure of the storage cell (capacitor) is directly available at the output pin, not hidden by digital line drivers. This is only true for some very early DRAM circuits, as later (including 4116) do use buffering drivers. Also their organization is no longer as a simple square matrix, like with 1 KiBit DRAM, but organized as at least two different blocks with sense amplifiers and decoders in between, thus making them in addition unusable for camera purpose (*2). Mostek's MK4096 4 KiBit RAM is about the last generation with only a single RAM cell array organized as 64x64 bits (*3). Long story short, there is no luck for you to make it happen with a 4116. At least not the same way as the Cyclops. A pure B&W may still work with a lot of fine tuning. *1 - Here is a nice timeline and description of the basic workings in non-electronicsese. *2 - A picture where only the upper and lower 40% are captured isn't very useful either - and using only one side would result in only about 25% of all cells used (*4), thus making a 16 KiBit RAM-CCD no more useful than a 1 KiB one. This is BTW also the reason why chip designers used a physical structure of two blocks with 128x64 cells each - thus the wiring, to reach each cell, for a 16 KiBit RAM wasn't more complex and space consuming than for a 4 KiBit. *3 - The 64x64 array isn't as square as it seems, but almost 16:9 ... did they plan ahead for HDTV? *4 - 31% with a 4:3 picture format. Then again, with some lens tricks the entire half might be used - though 128x64 is a weird resolution, isn't it? We tried it in the lab, circa 1984. I believe that we ended up having to write 1s or 0s depending on the bit position as some of the RAM bits were inverted. Sadly we never tried it with a lens, but I definitely remember we showed it was light-sensitive, and fiddly. We did it on a single board computer our company designed, which was a 160 x 100 mm, 6809 CPU with 64 Kbyte DRAM. Out of cost-engineering, there was no dynamic RAM refresh circuitry. Instead we used a non-maskable interrupt to run through enough addresses to keep the DRAM refreshed; from memory it was something like 64 or 128; this made it easy to do the test. We would have written a special test program in EEPROM, with the NMI generator disbled. I believe with did it with US-made milspec chips: I certainly remember we had very few chips in ceramic packaging other than EEPROM and the occasional CPU. The chips didn't have a window: we ground off the top and the chip was open to the air. Sorry to come late to this party. One thing to note is that, in order to use the DRAM in the way that the Cromemco Cyclops does, it must be a design with a non-destructive read. The 4008 parts (both AMI and Mostek) are three transistor per cell DRAM designs with non-destructive reads. One other piece of information that I can provide is that, on an S-100 bus system with a 2MHz 8080 processor, transferring the captured image real time to a Dazzler display, the frame rate tops out at about four frames per second. As others have pointed out, the Cromemco Cyclops turned this into a (hobbyist) product. I've also found I could get reproducible transient bit flips in an unprogrammed EPROM. Shine a laser pointer onto the chip, and the cells under the light will flip, then flip back when the light goes away. I'm not sure of the mechanism, and I don't even remember whether it was 0 -> 1 or 1 -> 0 (it was definitely only one of those, though). Sensitivity was VERY low (needed a direct hit from the beam). Not the answer you're looking for? Browse other questions tagged hardware graphics 4116 dram or ask your own question. In what ways is DRAM likely to fail?